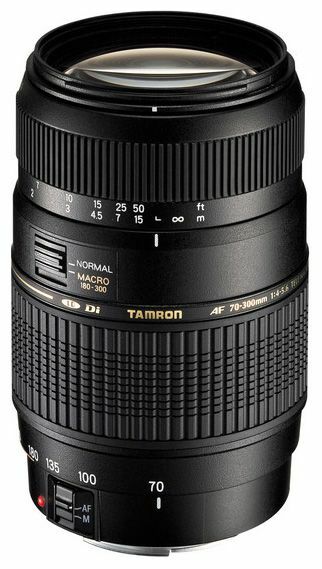 Product Overview Tamron now offers a lightweight, compact, high-image-quality telephoto zoom lens with macro capability of 1:2 that can be used with digital cameras. This new lens is a Di type lens using an optical system with improved multi-coating designed to function with digital SLR cameras as well as film cameras. With this 70-300mm telephoto zoom lens, flipping a macro switch in the focal length range of 180mm to 300mm obtains a maximum magnification ratio of 1:2 at a minimum focus distance as short as 37.4", enabling close-up shots of flowers, insects, and other objects that normally require the use of a specially designed macro lens. Moreover, this is a zoom lens that casually offers the distant capture and foreshortening effect pleasures of the 300mm ultra-telephoto world.